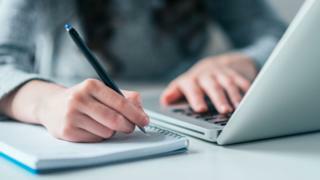 There have been repeated warnings from university leaders about the risk of cheating from students using online essay writing firms. Such firms might say they are offering legitimate help for students, but the higher education watchdog, the Quality Assurance Agency, has warned they can be "unscrupulous services that damage reputations and lives". "Companies that try to entice students to buy so-called plagiarism-free essays pose a real threat to the academic integrity of our higher education," said Douglas Blackstock, head of the QAA. How do you stop online students from cheating? The QAA wrote to PayPal in November calling on the firm "to close down the payment facilities for the essay-writing companies that encourage students to cheat". A PayPal spokesman said: "We carefully review accounts that are flagged to us for possible violations of our policies, as well as UK laws and regulations. "An internal review is already under way looking at the implications of essay writing services. "We would be happy to talk to the Department of Education about their concerns." The education secretary wants payment service companies to take action to stop such "essay mills" - and says their "corporate reputation" should matter to them. He said the QAA identified 17,000 academic offences in 2016 - but it was impossible to know how many cases had gone undetected. "Sadly there have always been some people who opt for the easy way and the internet has seen a black market in essay writing services spring up." Mr Hinds added that such firms are "exploiting young people and it is time to stamp them out". "I am determined to beat the cheats who threaten the integrity of our system and am calling on online giants, such as PayPal, to block payments or end the advertisement of these services - it is their moral duty to do so," said Mr Hinds. He also suggested that universities should adopt "honour codes", in which students formally commit to not cheating, and also recognise the consequences facing students who are subsequently caught. Sir Anthony Seldon, vice-chancellor of the University of Buckingham, said: "Cheating should be tackled and the problem should not be allowed to fester any longer. "Legislation is needed to outlaw this abominable practice, but this is a valuable first step." The education secretary's call for a tougher line on essay writing services was backed by Chris Hale of Universities UK. He said the university organisation wanted "essay mills to be made illegal and we continue to work together with government, the Quality Assurance Agency and other higher education bodies to tackle their use".